Every organization can be viewed from two perspectives. There are external processes such as procurement and sales, and internal processes such as management and operations, finance, marketing, and human resources. 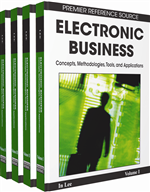 This article primarily focuses on external, commercial e-business processes. B2B (businessto- business) e-business is the sale of products or services, or information exchange, among two or more businesses through electronic technology, usually involving the Internet, through a public or private exchange. The following background section gives a very brief general overview of B2B e-business history. In the main thrust of this article, we discuss making the B2B decision by examining key B2B business requirements and benefits, as well as describing basic approaches to B2B e-business implementation. In the subsequent section, the article provides a future outlook for e-business.